这个事实很容易证明。首先假设有一个伯努利试验。试验有两个可能的结果：1和0，前者发生的概率为p，后者的概率为1−p。该试验的期望值等于μ = 1 · p + 0 · (1−p) = p。该试验的方差也可以类似地计算：σ2 = (1−p)2·p + (0−p)2·(1−p) = p(1 − p). ^ Neumann, P. Über den Median der Binomial- and Poissonverteilung. Wissenschaftliche Zeitschrift der Technischen Universität Dresden. 1966, 19: 29–33 （德语）. ^ Lord, Nick. (July 2010). "Binomial averages when the mean is an integer", The Mathematical Gazette 94, 331-332. ^ 3.0 3.1 Kaas, R.; Buhrman, J.M. 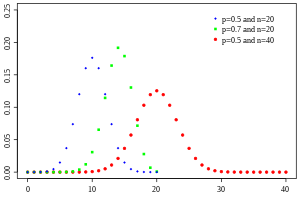 Mean, Median and Mode in Binomial Distributions. Statistica Neerlandica. 1980, 34 (1): 13–18. doi:10.1111/j.1467-9574.1980.tb00681.x. ^ 4.0 4.1 Kais Hamza. 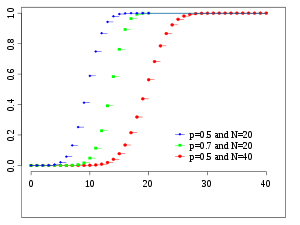 The smallest uniform upper bound on the distance between the mean and the median of the binomial and Poisson distributions. 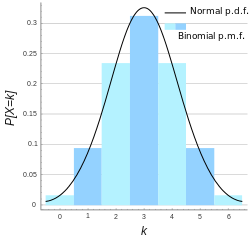 Statistics & Probability Letters: 21–25. [2018-04-02]. doi:10.1016/0167-7152(94)00090-u. ^ Box, Hunter and Hunter. Statistics for experimenters. Wiley. 1978: 130. ^ NIST/SEMATECH, "6.3.3.1. Counts Control Charts", e-Handbook of Statistical Methods.